I was honored (and super excited) to receive a parcel from Pentel, pretty much one of the most drool worthy pen manufacturers ever and magical like a liger. I had no idea what would be inside, so opening it up was truly a pleasure. I mean, I knew there would be Pentel goodies inside, and you can't go wrong with that. Unbelievably pretty. Note there's a 0.5mm, and 1.0mm, along with all the 0.7s! And go wrong, they did not. The most exciting thing was the eight pack of EnerGel-X gel pens that I have been searching for as if my life depended on it. What's so amazing about this eight pack? THE COLORS. It has the new pink, orange, and sky blue that I desperately coveted. Since they are so delicious, I thought it most appropriate to review the 0.7mm EnerGel-Xs first. The Pentel EnerGel-X pens are good looking, hands down. 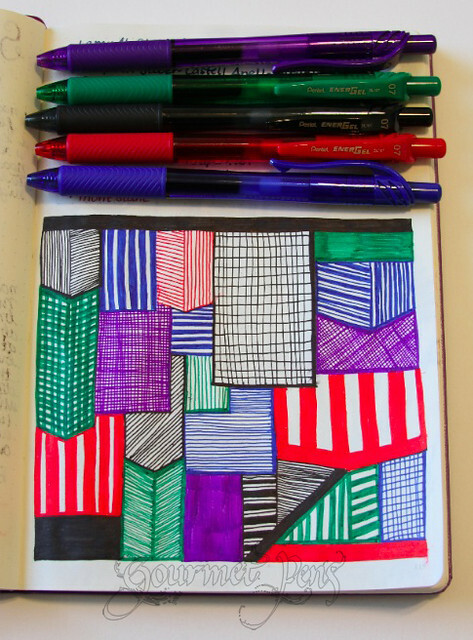 Honestly, when I walk down the stationery aisle at Staples, they're always one of the gel pens that catch my eye. Vivid, intense, brightly-colored barrels, with perfectly color matched clips and grips. 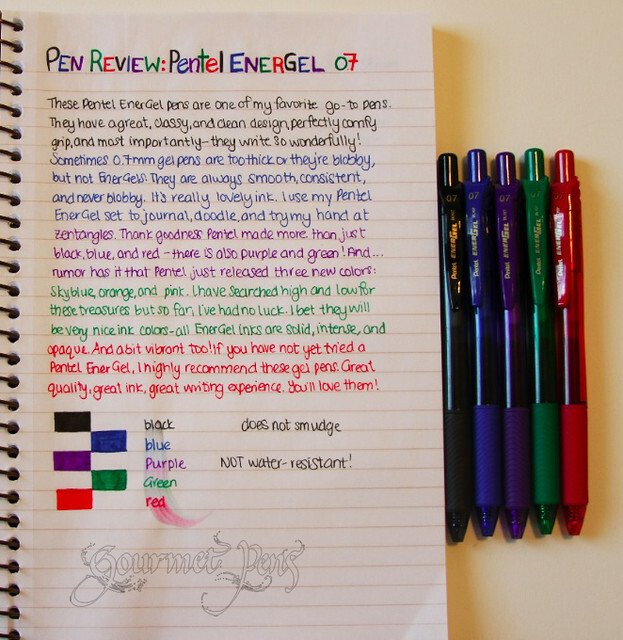 These gel pens write very, very smoothly, with solid tips, and great-flowing, wet ink. The 0.7mm tips put down solid, consistent lines. Even on cheap paper, the ink does not feather and spread - therefore, the lines always look crisp and precise. I can't even accurately describe how comfortable the EnerGel-X pens are to hold. The grip is perfect. It's not too squishy, and not too firm. 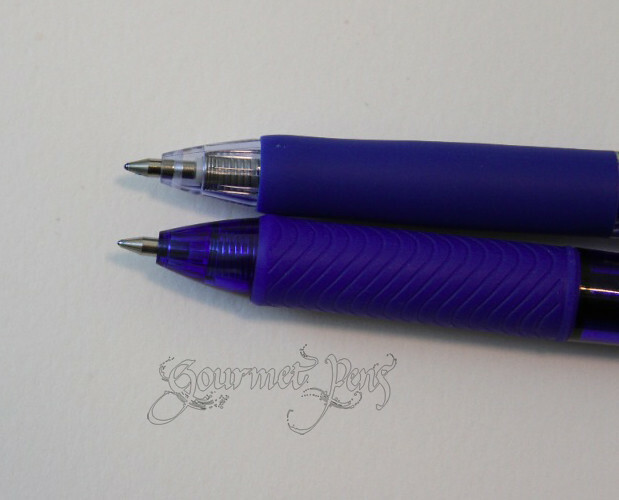 It has ridges in it to add texture, but they don't cut into your thumb if you're gripping the pen tightly. And the other thing - you don't even need to grip the pen tightly to write, because the ink is so smooth, it practically glides off the tip. I absolutely love writing with these pens!! Just a little writing sample. Ok I tried to be creative. Having the whole set is awesome. I'm so happy that Pentel actually makes a whole variety of colors, not unlike the Pilot Hi-Tec-C (whose range is of course far greater) but cannot be found easily unless you're online. I mean, if you're in the mood for an EnerGel, you can just stroll to Staples. Which is great for when you need an immediate stationery fix. Dots with the 8 pack of colors! I love dots. It's one of the few things I can draw. Eghhh this I'm a little ashamed of. Please don't judge me based on this writing. I was just messing around. The point was that these pens are GREAT for doodling because of the smooth, crisp lines, low smudging, and fabulous ink coverage. 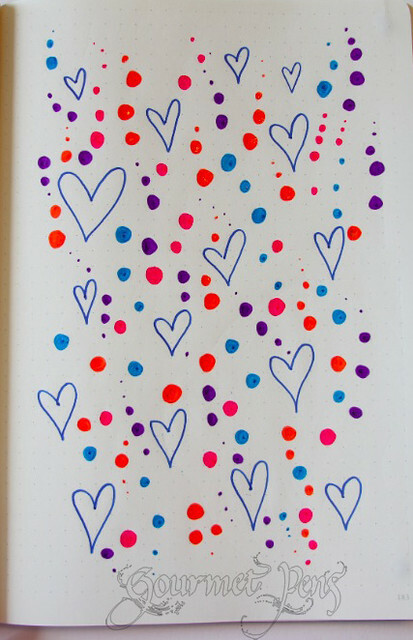 Apparently I can draw hearts too. Another thing I love about these pens is that they're made of 84% recycled plastic, and they are part of Pentel's Recycology program. While I believe the next step is to make these pens refillable with ALL the colors - because the bodies are solid and durable - having 84% recycled material in its parts is a great start, and having the main colors as refills is great. 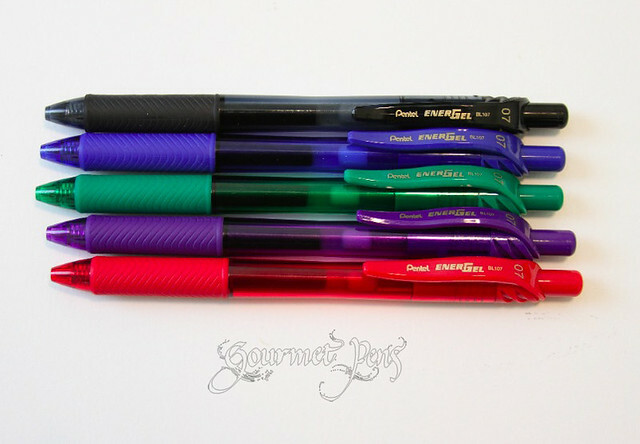 So unless you're only interested in the main colors - black, blue, red, purple, and green They are one of the best looking recycled plastic gel pens on the market. 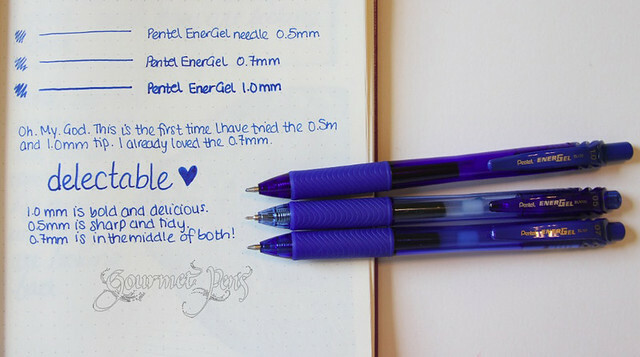 The Pentel EnerGels also come in 0.5mm needle tips and 1.0mm tips. A whole spectrum of tip sizes! How perfect. Just so you can see what the other tip sizes are like. 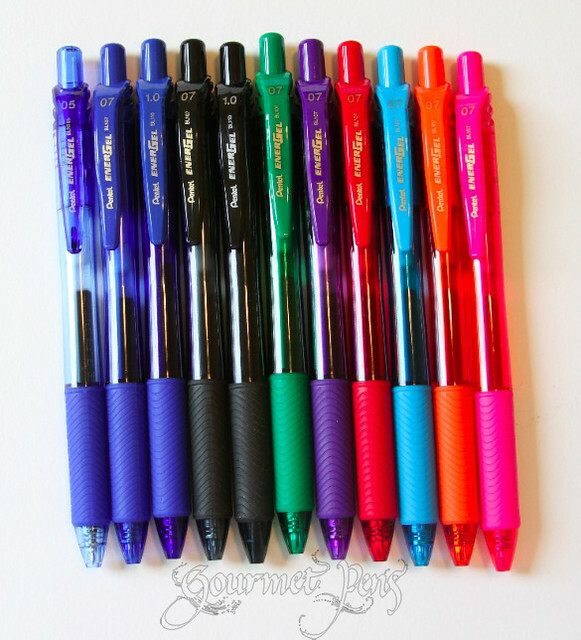 If you are looking for another gel pen to compare the Pentel EnerGel-X pens to, think the Uni-ball Signo 0.7mm. Pentel has produced a great quality pen here, and a great writer. 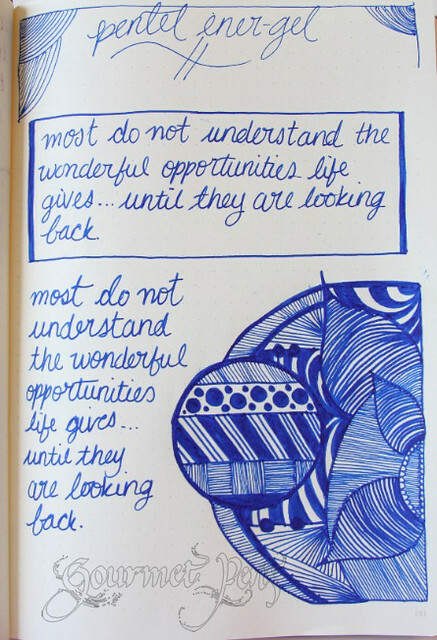 Sitting next to a Uni-ball Signo RT 0.7mm in blue. Not to toot Pentel's horn or anything but the grip is pretty good looking, isn't it? Be aware though, these pens are NOT water resistant! 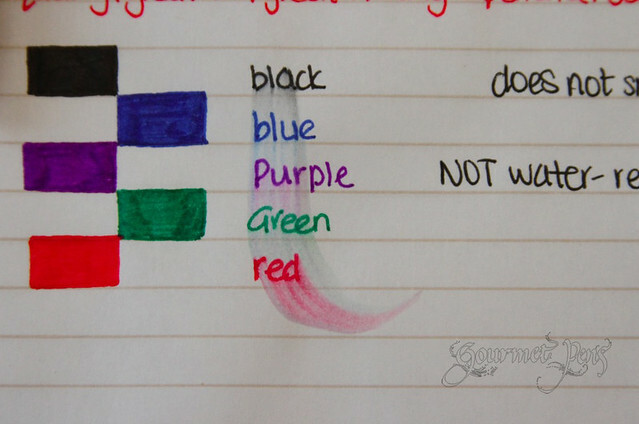 In my opinion, it's more important that they don't smudge. You can avoid water more easily than you can avoid smudging. Highly recommended. 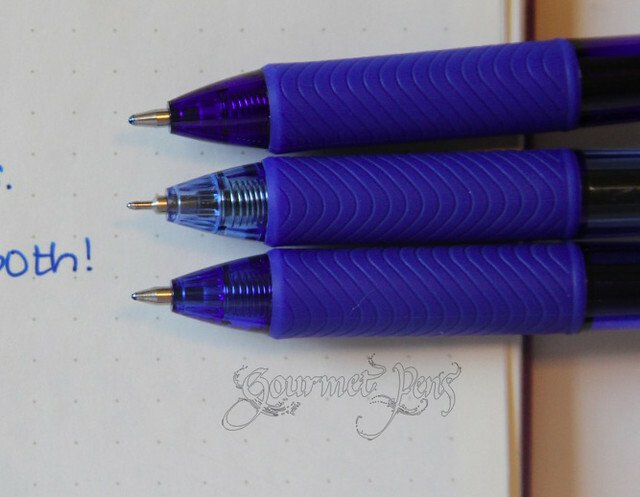 In my humble opinion, these are one of the best looking, best writing gel pens on the market, so long as you aren't looking for a micro tip pen. Solid, bold colors, and comfortable bodies are a great combination. 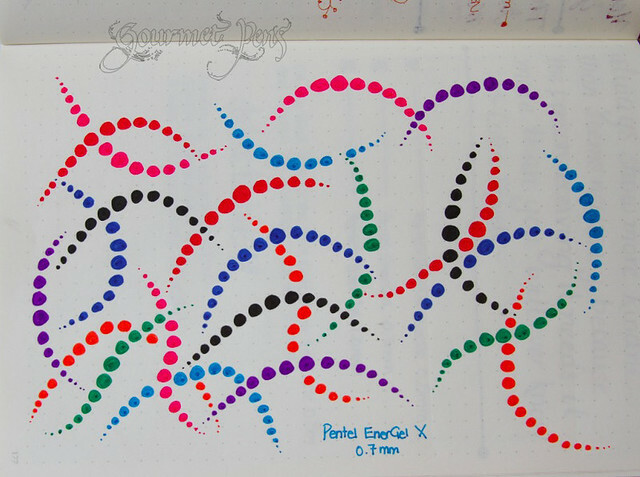 If you have not yet tried the Pentel EnerGel-X, well, not only is that an atrocity, it is complete insanity. We must remedy that immediately. 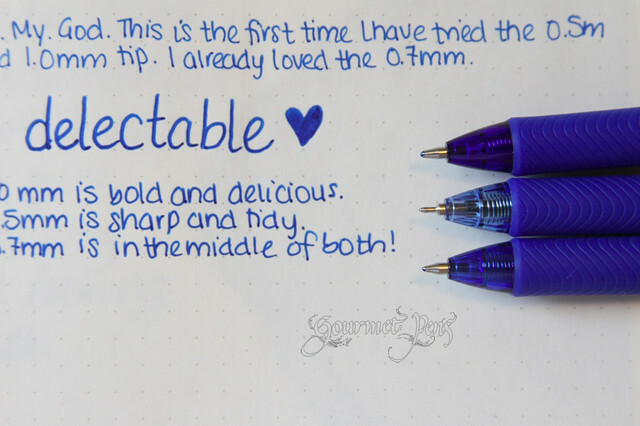 See my review on Pentel's blog! **I was provided with one or more of these products for review, but all opinions are my own! Pentel is my favorite pens for work. I use a different gel set from them and the colors are always so dark/vivid they help me to organize my thoughts and schedules. But really the "flow" is what I like best. I have a muscle issue that regular pens aggravate. I can really tell the difference in the "drag" of other pens. These flow and do not aggravate my wrist or elbows. In fact, until I found Pentel gels (originals) I didn't realize how much other writing utensils aggravated my muscle issues but now I can really notice a difference if I am using something else even for a few minutes. I will look for these in the store. I am sure I won't be disappointed!!! THANKS for the review!!! JetPens is out of the violet and I'm putting you to blame. It's obvious your review made everyone go "Oooo, pretty!" and bought out the one I wanted. SIGH.